It’s alive I tell you! 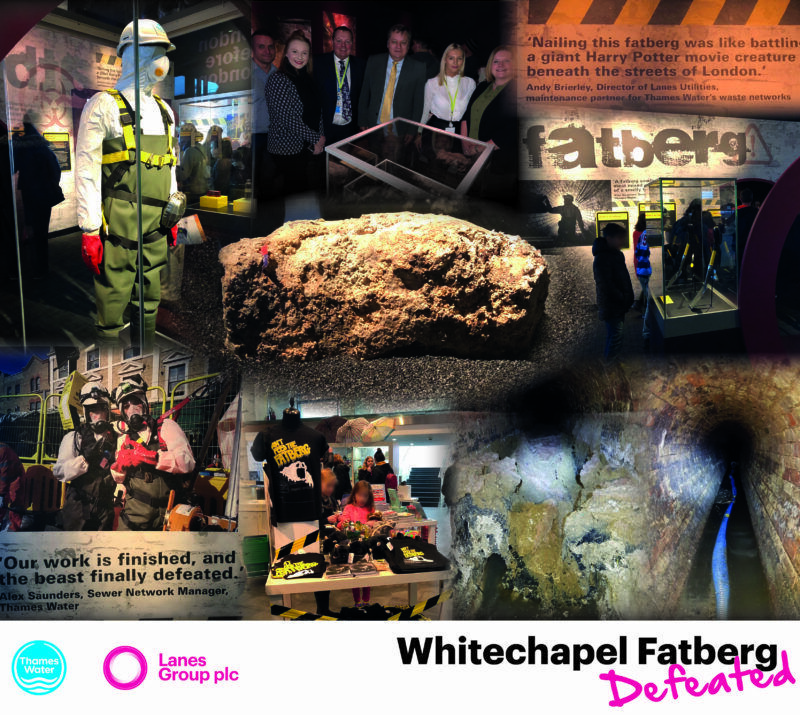 A small part of the “monster” Whitechapel fatberg, removed by Lanes Group plc on behalf of Thames Water, has gone on display at the Museum of London. Seven thousand visitors visited Fatberg! in the first weekend to view the last remaining chunks of the giant mass of fat, wet wipes, and other noxious nasties that blocked a main sewer for 250 metres in East London. They could see that the fatberg fragments are alive, because they still contain drain fly larvae, which occasionally transform and take wing to buzz around inside the airtight display boxes. Fatberg! tells the story of how Thames Water and Lanes Utilities, part of Lanes Group plc, its wastewater network services partner, worked to remove the huge sewer blockage, and why it was there in the first place. It explains how fatbergs cause havoc by preventing homes and businesses from using toilets and sinks, triggering flash floods and environmental pollution, and contributing to the dumping of plastics, from wipes and sanitary products, into the environment, harming wildlife. Andy Brierley, Director of Lanes Utilities, said: “There is no doubt that the fatberg exhibition will fascinate and disgust museum visitors in equal measure. “Fatbergs are a modern phenomenon created by us humans. It’s our failure to properly dispose of fats, oil, grease, and wet-wipes that should not be poured and flushed into the sewer system that creates fatbergs in cities across the UK. “We hope people enjoy the display and appreciate the diligent work of our teams who had to go down into sewer, a highly-hazardous environment, and break up the Whitechapel fatberg with hand tools because the combination of materials in it made it so hard. After Lanes Utilities wastewater engineers had cut off three pieces of the Whitechapel fatberg and took them to the surface, the Museum of London had to seek expert scientific advice about how best to preserve them safely. Just a tiny amount of the congealed fat, wipes, and sewage was potentially-deadly. After careful thought, it was decided to dry the fatberg morsel, a tiny part of the 130-tonne monster that had filled the sewer system last summer. When Lanes engineers first lifted the fatberg samples from the sewer they smelled like a combination of rotting meat and very dirty toilets, and had the consistency of concrete. Now they have been dried out, they are more fragile and a bit less smelly, but they are still serious bio-hazards so need to be kept well away from museum visitors. Lanes Group is already campaigning against the environmental damage caused by fatbergs, with its Fatberg Fighters schools programme, which helps educate children about what can and cannot be put down sinks and drains. Michelle Ringland, Head of Marketing at Lanes Group, said: “The Museum of London is to be congratulated for its Fatberg! exhibition. It’s captured the public’s imagination and has attracted global media interest. Within the display is a caption of a quote from Andy Brierley, explaining how clearing the Whitechapel Fatberg was like battling a Harry Potter monster beneath the streets of London. The Museum of London says it is not sure if its fatberg samples can be kept for long due to the risk of decomposition. During the exhibition, the displays will fuel the imagination and, no doubt, a bout of British toilet humour. The exhibition’s sponsor, Thames Water, hopes it will also play its part in consigning fatbergs to history, by encouraging us all to better-control what we flush down our sewers and drains. You can see Fatberg! at the Museum of London until 1 July 2018. Entry is free.